To request a press release, review copy, author image or to organise an extract or interview. Following the death of her mother, Anna Flowers must leave behind her childhood home and move with her father Ken to the town of Peppersalt, hundreds of kilometres away. The only people she knows in Peppersalt are her boring Aunt Gladys and crazy Nana Bessie. To make matters worse, on the first day of school Anna has a run in with the school bully and netball captain Michelle—whose father is Ken’s nasty new boss. 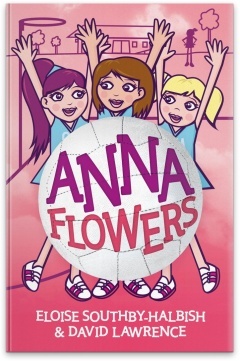 However, with the help of Nana Bessie, who used to play netball for Australia, and her group of friends, known as the ‘Misfits’, Anna is determined to silence Michelle and become a netball star. Anna Flowers is a story of courage and determination, both on and off the court. The book offers a unique perspective on netball, while exploring the obstacles that arise when trying to find your place in a new environment, including the difficulties fitting in and making new friends. Eloise Southby-Halbish played 34 Tests for the Australian netball team and was co-captain of the Melbourne Phoenix. Following her retirement she worked as a netball commentator for ABC Sports and Fox Sports. She is currently the assistant coach at the Melbourne Vixens and an employee at Netball Victoria. David Lawrence, is a comedy writer whose TV credits include , Hamish & Andy, TV Burp and Talkin' 'Bout Your Generation. He runs the successful comedy business Laughing Matters and has performed in five Melbourne International Comedy shows. He has won three Brownlow medals in a parallel universe. Read a review of Anna Flowers on Motherpedia. © 2019 The Slattery Media Group ABN: 57 217 020 071. All rights reserved. Please complete all required fields before proceeding. Would you like to remove from your cart? Removing any item will also remove any coupons you may have entered from the cart. If you are processing a coupon with your order, you may need to re-enter your code again before proceeding to payment.